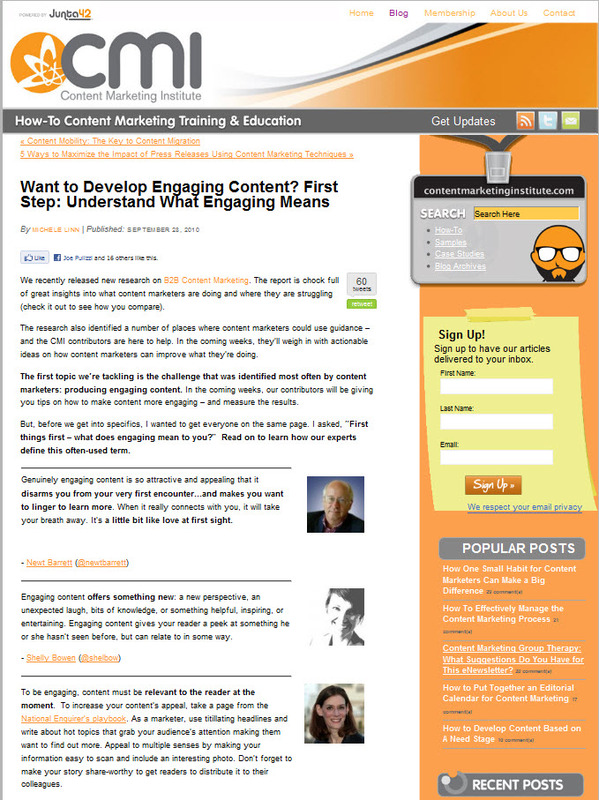 We've reached the end of the Content Marketing Institute series on content engagement. The last post - 13 Examples of Content that Engages - describes examples of engaging content and highlights what makes them engaging. 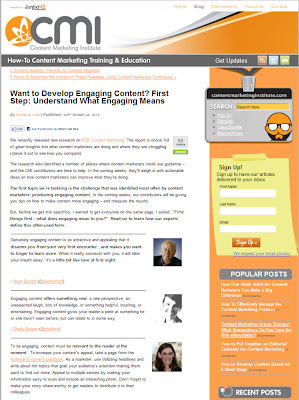 I can't imagine better timing than Bathroom Blogfest 2010 for this post and my example! The range of examples is fascinating and inspiring so do be sure to read the original post. Once you've done that, I'd love to hear about examples you've come across that you consider engaging content marketing. Having listened to David Meerman Scott discuss Real-time Marketing, I can't help but appreciate that Bathroom Blogfest 2010's Mad Men inspired theme 'Stuck in the 60s?' represents real-time marketing. According to David Meerman-Scott, "Real-time is a mindset." Companies that adopt a real-time mindset are poised to benefit. Take news organizations that have embraced real-time: TMZ, Politico, Huffington Post. Few companies operate effectively in the present. They typically draw from the past and plan far into the future, leaving the now - i.e., real-time - completely ignored. Connecting with customers. E.g., hashtags provide access to the back channel on Twitter. Sit/Squat is not only a smartphone app, but it encourages crowd-sourcing. Creating products. E.g., the Dead sell concert CDs available as you leave the show. They even have an iPhone app [for 2009 concert season]. In the book business, eBooks allow authors to create content in real-time. Listening to the Market. E.g., Paul Dunay at Avaya does so. Tapping the Crowd. E.g., Kodak asked customers to help name a new waterproof videocamera. Engaging the Media. E.g., working with the media when it is interested. Consider leaving comments on relevant WSJonline [or other] posts and pinging the reporter when you have relevant information to share so you are noticed. CRAP your logo which allows anyone to crate a GAP logo fiasco -inspired logo. and from Tonic, Twitter Me Elmo: "Sesame Street" Schools Social Media. Does it get much better than this? Let me know. Susan Abbott from Customer Experience Crossroads - creator of the Bathroom Blogfest 2010 logo - is responsible for getting me thinking about Mad Men and realizing what a conversation generator the show has become. Her July post MadMen shows us a stratified society: things HAVE changed had me thinking about society, culture, business, the work environment. It inspired the theme for Bathroom Blogfest 2010. After reading Susan's post, I realized that I was missing out on a profound cultural phenomenon - somewhat like the Sopranos, but even more universal since mobsters from New Jersey have limited appeal. I have a confession: I haven't watched much of Mad Men. For that matter, I haven't watched much TV lately. The timing is bad; it conflicts with my daughter's bedtime; it distracts from my most productive writing time. I did manage to watch 20 minutes worth but realized I wouldn't be watching much more. To compensate, I read Mad Men Unbuttoned: A Romp Through 1960s America and have been paying closer attention to the Mad Men phenomenon, uncovering in the process a multitude of conversations that span many worlds - from PR, to leadership, fashion, social behaviors and even Sesame Street! From Adam Vincenzini's The Don Draper Guide to Social Media Marketing. 3:17am's discussion Ras’s Web Gems: Is Don Draper Leadership Material? I wondered about conversation patterns generated by Mad Men interest. Here's what I discovered. The chart below captures conversations from my social media marketing database during the past 6 months that refer to Mad Men. Notice the spike when the season started and the sustained level of conversation generated since. Contrast that with approximately the same number of conversations from my retail experience database for the same six month timeframe. Notice how the conversations ramps up more gently at season launch and get more intense by season ending. What's your take on Mad Men? Have you found signs of it wherever you go? Does it generate conversation? I'd love to hear. Note: charts generated through eCairn Conversation. You've seen the press release about Bathroom Blogfest 2010. I'm here to confirm that Bathroom Blogfest 2010 has begun! On Flooring The Consumer: I'll be examining how Water Matters, exploring ads and activities related to Bathrooms from the bathroom brands, and addressing bathrooms and the retail experience. On Simple Marketing Blog, I'll touch on Don Draper from Mad Men fame, share with you the last segment from Content Marketing Institute's engagement series, discuss real-time marketing and even touch on SEO. All with a BathroomEXP angle. On Carpetology Blog, I'll share with you February 2010 bathroom experiences from Surfaces and Las Vegas. On The Smoke Rise & Kinnelon Blog, you can count on local New Jersey Bathroom and plumbing experiences. Stay tuned here, but also visit BathroomBlogfest.com - I'll be issuing regular updates. Like Bathroom Blogfest on Facebook. Follow us on Twitter. 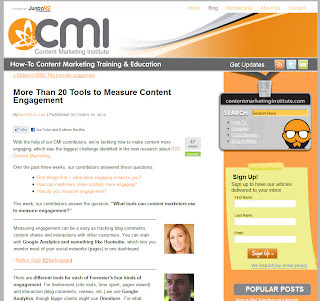 Continuing on with the Content Marketing Institute series on engagement, next is More Than 20 Tools to Measure Content Engagement. Previous posts included What Does Engaging Content Mean to You?, 10 Ways to Make Content More Engaging and How To Measure Engagement. 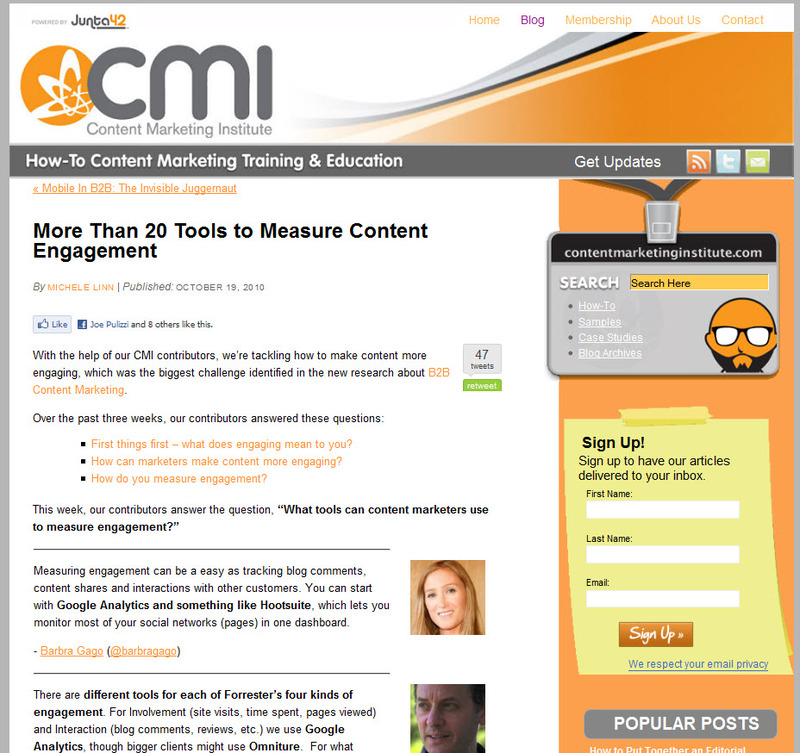 This week's post addresses What tools can content marketers use to measure engagement? Certainly a valid question given the pressure to demonstrate ROI and how many tools have become available. CB Whittemore (@cbwhittemore) <---- me! 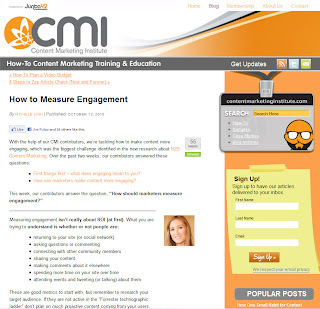 Tools abound for monitoring and measuring engagement – some free, some not. As marvelous as many of the for-pay tools are, I consider it important to learn, explore and calibrate what you obtain meaning from using free tools. By the way, this also allows you to determine whether your business goals are realistic and appropriate for your content. Two of my favorite tools for measuring blog and web engagement are Google alerts and Google Analytics. In Google alerts, I like to monitor my URL, my brand or blog name and my own name. Alerts let me know when conversations sparked by my content take place beyond my site. In Google Analytics, I like to monitor traffic patterns to understand which content resonates the most with readers and which words they may have used to discover my content. By the way, those patterns may suggest ideas for new content. I also pay attention to how much time readers spend on-site as a result of specific content or whether they ‘bounce’ off. On your website or blog, you may opt for a social sharing widget [e.g., AddThis], and even a Facebook Like button. Both offer feedback on engagement. For other digital platforms, such as Twitter, you may want to use a URL shortener to measure the engagement of links you share [i.e., Bitly or Owly or Supr]. YouTube, Facebook and Slideshare offer stats and counts, too, and blogging platforms will keep count on your comments. What’s important, given how many options exist for measuring content engagement, is determining the purpose of your content so you end up measuring interaction relevant to your goals and don’t get so caught up with the data that you lose sight of the human aspects of engagement. What's your take? 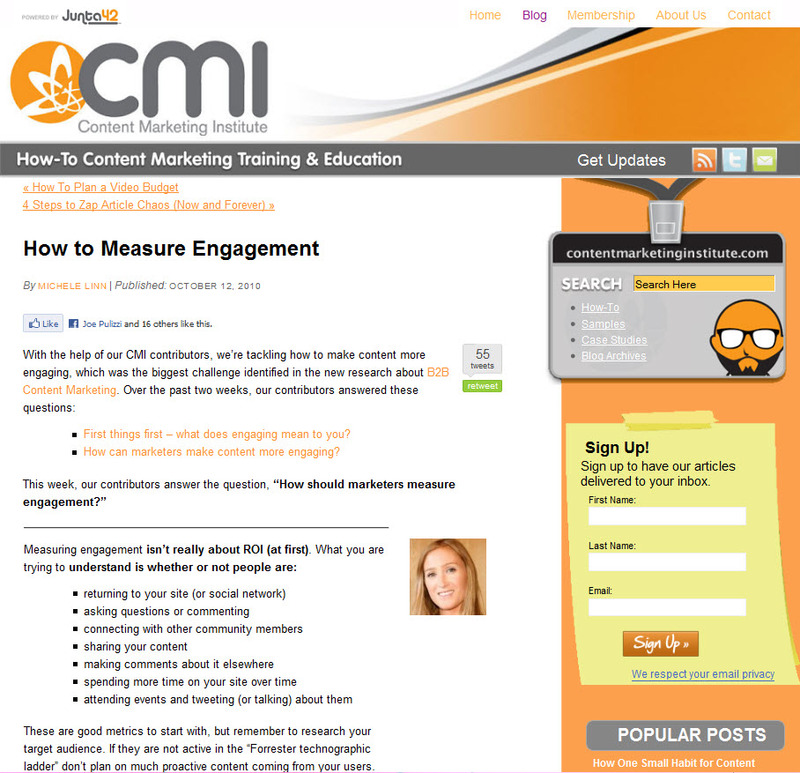 Which tools do you consider most valuable for measuring engagement? Why? I'd love to hear. For more information about the blogfest, visit http://www.BathroomBlogfest.com. Follow Bathroom Blogfest on Twitter @BathroomBlogfes, look for the tag “#BathroomEXP” on flickr, del.icio.us, Technorati, Twitter and Google or ‘Like’ on Facebook. 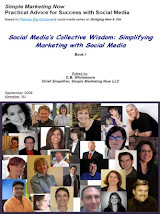 Or, contact Whittemore at cbwhittemore@SimpleMarketingNow.com. Blog Action Day takes place on October 15th. Today, it's about Water. Because it's about water, it's also about AOC3, otherwise known as The Age of Conversation 3. In honor of Blog Action Day, I'd like to invite you to purchase copies of AOC3 TODAY! In so doing, you support charity:water. Blog Action Day is truly a global experience when bloggers from around the world come together and blog about the same topic on the same day, thereby drawing intense, focused attention to a topic critical to us all. In 2009, the topic was Climate Change [I related it to the Retail Experience, too]. In 2008, the topic was Poverty. In 2007, the topic was The Environment. Water truly is a precious global resource that should be accessible to all. Enter The Age of Conversation 3 [AOC3]. Proceeds from sales of The Age of Conversation 3 are donated to charity. The charity we've chosen is charity: water. As co-editor of AOC3 Gavin Heaton explains, charity:water "is a non-profit organization bringing clean and safe drinking water to people in developing nations. 100% of public donations directly fund water projects. Amazingly, just $20 can give one person clean water for 20 years. 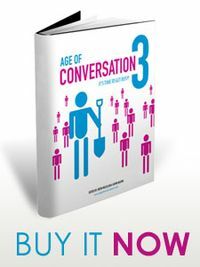 An average water project costs $5,000 and can serve 250 people with clean, safe water – so purchasing a copy of the Age of Conversation 3 really can make a difference to someone’s life!" Learn more about why charity:water is so focused on water! It's a big deal! In honor of Blog Action Day 2010, I invite you to purchase one or several copies of Age of Conversation 3. Proceeds from your purchase will be donated to charity:water and make a difference for those who need clean water. Simply click on this link which will take you to Amazon to purchase Age of Conversation 3. Thank you and Happy Blog Action Day! How do you go about connecting with customers, establishing relationships with them and then figuring out how to best stay in touch - particularly in categories where the replacement cycle takes years rather than days? These were some of the questions explored this past September 2010 during my visit with Canada Nufloors Group members in Kelowna, British Columbia. Here are points she addressed that particularly resonated with me. Finally, several resources in case you'd like to dive deeper into the subject of Connecting With Customers. From Tom Peters' marvelous free resources, a document titled "The Independent Retailer Edge: 49 Points of Potential Dramatic Difference." A Good Hug is Worth based on a presentation by Jack Mitchell, author of Hug Your Customers: The Proven Way to Personalize Sales and Achieve Astounding Results . Businesses find benefits in giving customers the white-glove treatment. Will You Recommend This Article to a Friend? As you read through all of this, what comes to mind for connecting with customers? What have you found most successful? How do you establish relationships and develop them consistently over time? By the way, Kelowna is as magical a place as Rob Banks led me to believe, with vineyards, orchards, mythical beings - if you look carefully in the photo, you'll catch a glimpse of the Ogopogo, cousin to LockNess and active on Facebook and Twitter, who has promised to eat me next time I visit - and unexpected encounters. It's definitely worth a visit to savor marvelous wines - we visited Ex Nihilo Vineyards, Gray Monk and Arrowleaf Cellars - and feast your eyes on brilliant scenery. 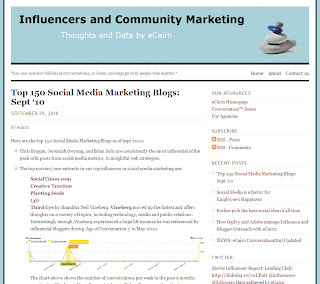 If you are looking for ideas about social media marketing blogs to explore, go no further than eCairn's recently released Top 150 Social Media Marketing Blogs: Sept '10 from September 29, 2010. I am a big fan - and user - of eCairn Conversation [see Social Flooring Blog Index - August 2010] and have experienced firsthand the robustness of the platform. This list definitely includes the finest thinking and most engaging content related to social media marketing. 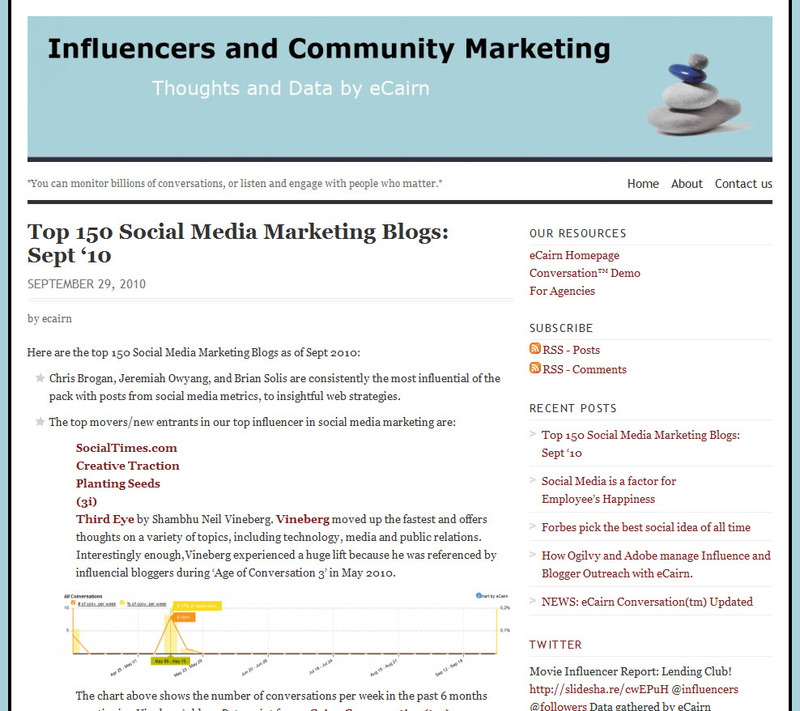 It also makes me very excited to discover that Simple Marketing Blog, launched in March of 2009 in a crowded segment of the blogosphere, ranks #87 out of the top 150 most influential social media marketing blogs that eCairn Conversation tracks. Pretty darn cool if I say so myself! A major Thank You to all of you for subscribing, reading, commenting and being part of what's going on here on the Simple Marketing Blog! That said, I do hope you will explore the other social media marketing blogs listed in eCairn's Top 150 listing. Let me know which are your favorites. PS: I'm partial to #18 MarketingProfs Daily Fix - not just because I'm a contributor ;-) - and many others written by friends. 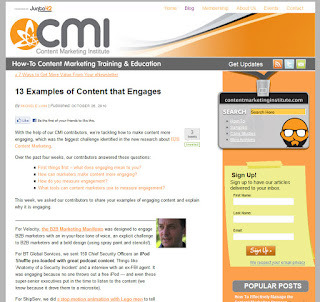 Last week, Content Marketing Institute asked What Does Engaging Content Mean to You? 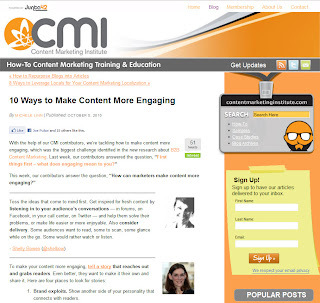 This week CMI asks How To Make Content More Engaging. Notice how often 'human' comes up. What's you take on how to make content more engaging? I'd love to hear your response. Are you ready? 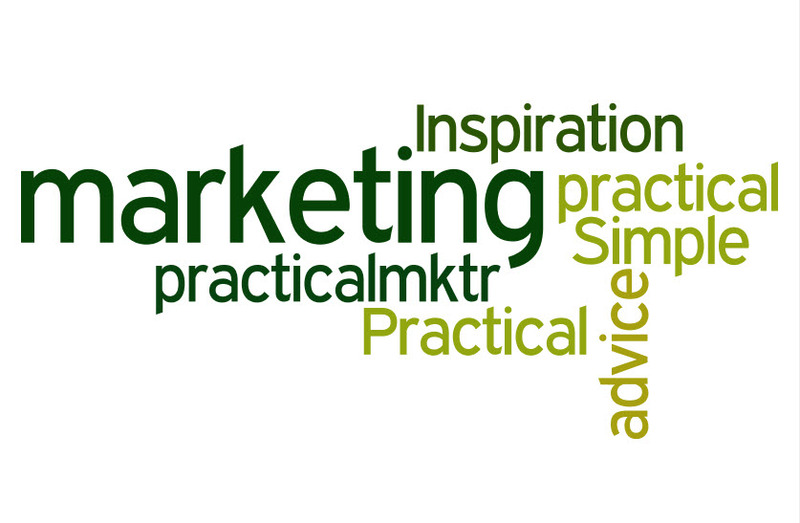 Here's the latest issue of Practical Simple Marketing In The News. These are links and resources shared on Twitter this past month with the tag #practicalmktr and grouped into categories. I hope you find these resources as exciting as I do. John Cleese on creativity is a gem and I loved the "Outside In" article from Wharton. Pretty cool, too, the growing list of brands and industries successfully experimenting with social media marketing. If you are interesting in the consumer retail experience, I've been doing something similar on Flooring The Consumer with Retail Experience links #retailexp. Which articles did you find most interesting? 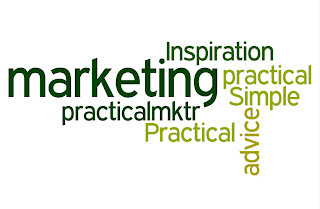 Here's a link to previous issues of Practical Simple Marketing In the News.